Living in Toronto, it’s hard to find those special untouched natural areas, especially near the water. Toronto’s beaches fill up like crazy every summer day, despite less than pristine swimming conditions – and if you travel further down Lake Ontario to Cobourg Beach, you’ll find less polluted water but still have to fight the crowds. However, situated right in the middle along the shores of Lake Ontario is Darlington Provincial Park, a hidden gem less than an hour’s drive from the city centre. Looking for an escape from my daily metropolitan life but with no time to drive several hours north of the city, I recently discovered the beauty of this park, tucked away and hidden from view. The park features four hiking trails that are all easy to moderate – perfect for young kids and people of all fitness levels. The hikes range from 30 minutes to an hour and feature a variety of birds, animals, flora and fauna (the McLaughlin Bay Trail even goes through a marshland). Want to keep going? The gorgeous Waterfront Trail is just a portion of a larger, 350 km trail that goes all the way along Lake Ontario – so the hike doesn’t need to stop where the park does. The open water of Lake Ontario is often rough and choppy – but luckily Darlington surrounds McLaughlin Bay, a protected area that is perfect for a peaceful canoe ride. On summer weekends, you can rent canoes and paddle boats by the hour – and if you’re able to keep your balance, you can even try your hand at fishing and see if you can bring home a Smallmouth Bass or Lake Trout. You can borrow fishing rods and tackle free of charge from the park store thanks to the Ontario Power Generation-sponsored Tackle Share program – so no pressure if you don’t get a bite! 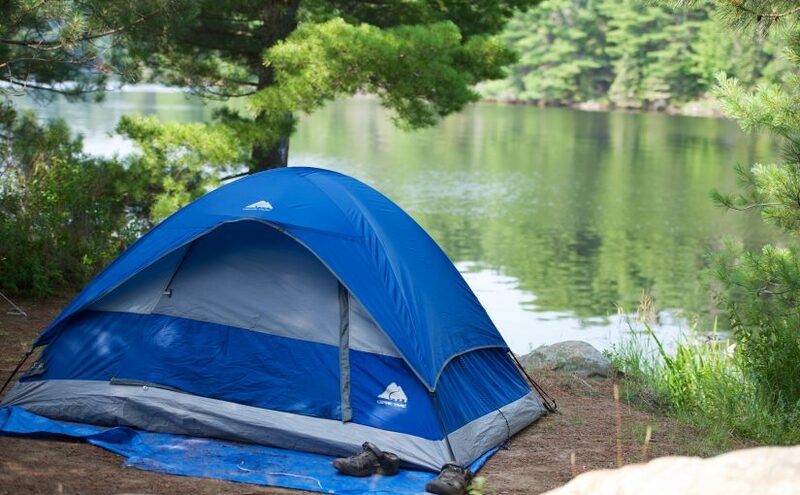 Darlington Provincial Park is the perfect day trip from Toronto – but you also don’t need to look any further for a good ol’ weekend-long camping trip. Spend the weekend bird-watching, swimming, and learning about the local ecosystem while returning to your tent – or for the less rustic, your car! – each night. Darlington has three different campgrounds for car camping where you can drive your car right up to your spot, as well as over 300 campsites for traditional camping, each with a fireplace and picnic table, and many with electrical services.